Look here for a clue. There's no foolproof way to know the future for Flow International (Nasdaq: FLOW) or any other company. However, certain clues may help you see potential stumbles before they happen -- and before your stock craters as a result. Rest assured: Even if you're not monitoring these metrics, short-sellers are. I often use accounts receivable (AR) and days sales outstanding (DSO) to judge a company's current health and future prospects. It's an important step in separating the pretenders from the market's best stocks. Alone, AR -- the amount of money owed the company -- and DSO -- the number of days' worth of sales owed to the company -- don't tell you much. However, by considering the trends in AR and DSO, you can sometimes get a window onto the future. Why might an upstanding firm like Flow International do this? For the same reason any other company might: to make the numbers. Investors don't like revenue shortfalls, and employees don't like reporting them to their superiors. Source: Capital IQ, a division of Standard & Poor's. Data is current as of last fully reported fiscal quarter. FQ = fiscal quarter. The standard way to calculate DSO uses average accounts receivable. I prefer to look at end-of-quarter (EOQ) receivables, but I've plotted both above. When that red line (AR growth) crosses above the green line (revenue growth), I know I need to consult the filings. Similarly, a spike in the blue bars (DSO) indicates a trend worth worrying about. As another reality check, it's reasonable to consider what a normal DSO figure might look like in this space. Source: Capital IQ, a division of Standard & Poor's. DSO calculated from average AR. Data is current as of last fully reported fiscal quarter. LFQ = last fiscal quarter. Dollar figures in millions. Differences in business models can generate variations in DSO, so don't consider this the final word -- just a way to add some context to the numbers. But let's get back to our original question: Will Flow International miss its numbers in the next quarter or two? I don't think so. AR and DSO look healthy. For the last fully reported fiscal quarter, Flow International's year-over-year revenue grew 26.7%, and its AR grew 8.3%. 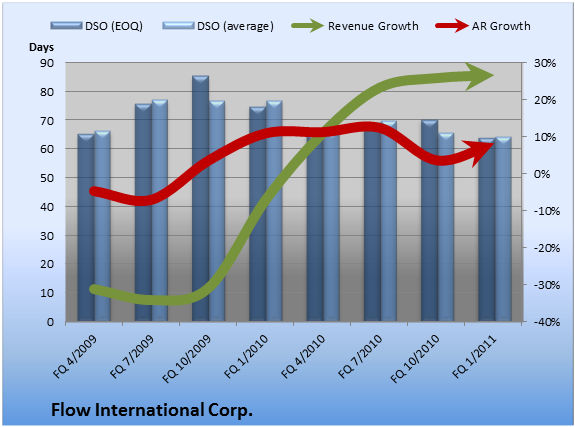 That looks OK. End-of-quarter DSO decreased 14.5% from the prior-year quarter. It was down 9.1% versus the prior quarter. Still, I'm no fortuneteller, and these are just numbers. Investors putting their money on the line always need to dig into the filings for the root causes and draw their own conclusions. I use this kind of analysis to figure out which investments I need to watch more closely as I hunt the market's best returns. However, some investors actively seek out companies on the wrong side of AR trends in order to sell them short, profiting when they eventually fall. Which way would you play this one? Let us know in the comments below, or keep up with the stocks mentioned in this article by tracking them in our free watchlist service, My Watchlist. Add Flow International to My Watchlist. Add Hardinge to My Watchlist. Add John Bean Technologies to My Watchlist. Add CIRCOR International to My Watchlist. How Fast Is the Cash at Flow International? Does This Mean Flow International Will Bomb Next Quarter?